CLEVELAND – Looking for a fun, family-friendly outing to bring in the New Year? The perfect hassle-free afternoon date? A low-key, high-energy friends and neighbors celebration? 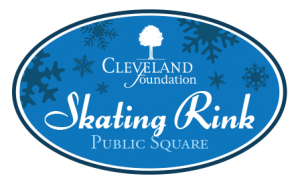 The Cleveland Foundation Skating Rink will be open for FREE skating from Noon – 10 p.m. on Dec. 31, 2017. The free skating offer includes skate rental and 45 minutes of skating time. To take advantage of this free offer, stop by the skating kiosk in Public Square beginning at 10 a.m. to pick-up free passes. Passes will be distributed for each 45 minute session chronologically until they run out. Those with passes will be required to check-in at the Cleveland Foundation Skating Rink 15 minutes before the start of their session to receive skates and prepare to enjoy the ice! A maximum of 6 passes per individual will be distributed. This is the second FREE skate event presented by the Cleveland Foundation this holiday season. The first was during Winterfest on Nov. 25. Passes during Winterfest were distributed in full by 5 p.m.
For more information about the Cleveland Foundation Skating Rink, including general hours of operation and pricing, please visit www.clevelandpublicsquare.com. B-roll and photos available for news media.